The Floor offers small group classes in Pilates, Yoga, Self Care, Pre/Post-Natal Conditioning and Baby & Me classes. In addition to open classes, we offer Thai Massage & Therapeutic Massage. A METHOD INTRODUCED BY JOSEPH PILATES IN THE EARLY 20TH CENTURY, PILATES IS KNOWN AS THE ART OF CONTROLLED MOVEMENTS. THROUGH EMPHASIS ON ALIGNMENT, BREATHING, AND MUSCLE STRENGTHENING, IT IMPROVES COORDINATION, AND BALANCE, AND PROMOTES PHYSICAL AWARENESS, FITNESS AND ACTIVE ENERGY DISTRIBUTION ACROSS THE BODY. We offer beginner-advanced levels as well as open level classes. WE KEEP IT BASIC IN THIS CLASS. IF YOU'RE NEW TO PILATES OR COMING BACK FROM AN INJURY, THIS CLASS WILL MAKE YOU FEEL CONFIDENT AND SECURE IN THE PILATES TECHNIQUE. you can expect a standard open level pilates class, combined with foam rolling and pink ball fascia release. ORIGINATING FROM INDIA, YOGA PROPOSES TO JOIN BODY, MIND AND FAITH INTO ONE PRACTICE. WE OFFER A BROAD VARIETY OF YOGA CLASSES, UNITING DIFFERENT TRADITIONAL METHODS WITH INTEGRITY AND PURPOSE. we offer open level yoga classes as well as intermeidate and restoraitve yoga. A CLASS DESIGNED TO MAINTAIN A HEALTHY BALANCE IN THE BODY. FASCIA RELEASE, BREATHING TECHNIQUES, SUPPORTED POSTURES AND GENTLE TONING MAKE THIS CLASS PERFECT FOR BEGINNERS TO ADVANCE MOVERs, WHO NEED TO RESET. THE GYROKINESIS METHOD ADDRESSES THE HEALTH OF YOUR SPINE AND CONNECTIVE TISSUE. 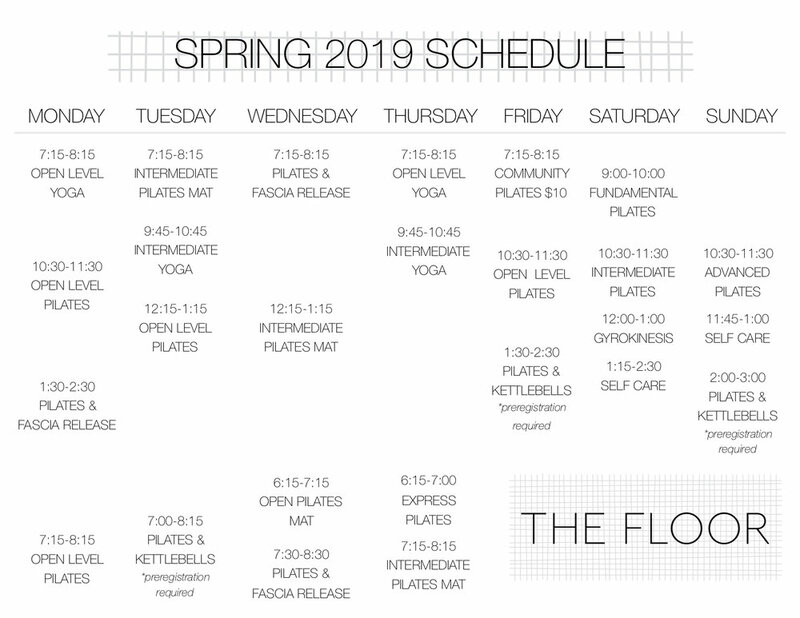 THROUGH A SERIES OF BREATH-DRIVEN MOVEMENTS PERFORMED SEATED, STANDING AND ON THE MAT, THIS CLASS WILL EXPLORE DECOMPRESSION OF THE SPINE AND JOINTS, MOVING FLUIDLY AND EFFICIENTLY WHILE BUILDING STRENGTH AND CONNECTION IN THE BODY. GYROKINESIS FEELS LIKE DANCING, TAI CHI, YOGA AND SWIMMING BLENDED INTO ONE. SIDE EFFECTS MIGHT INCLUDE: IMPROVED POSTURE WITH LESS EFFORT; REDUCED PAIN AND MUSCULAR TENSION; STRONGER CORE AND A GENERAL FEELING OF CALM. ALL AGES AND ABILITIES WELCOMED. NO PRIOR EXPERIENCE NECESSARY. MYSORE CLASSES ARE TAUGHT TO STUDENTS AS INDIVIDUALS SO THAT THE STUDENT EPXERIENCES HEALING AND STRENGTHING EFFECTS. NEW STUDENTS CAN SHOW UP ANYTIME DURING THE ALLOTTED TIME FRAME AND EXPECT TO STAY FOR 30 MINUTES ON THE FIRST DAY. FROM THERE YOU WILL LEARN A LITTLE MORE EACH DAY, EVENTUALLY DEVELOPING A PRACTICE THAT IS 60-75 MINUTES IN LENGTH. LED PRIMARY CLASSES IN WHICH THE POSTURES AND BREATH ARE COUNTED OUT LOUD ARE OFFERS TO CREATE AND MAINTAIN A STEADY RHYTHM THROUGH A FULL PRACTICE. ALL OF THESE CLASSES ARE OPEN LEVEL AND THERE IS NO PREVIOUS EXPERIENCE REQUIRED TO ATTEND. PLEASE FEEL FREE TO COME AND ASK QUESTIONS AND OBSERVE IF YOU ARE NEW TO THIS SYTLE OF YOGA. YOGA IS FOR EVERYONE REGARDLESS OF AGE, STATE OF HEALTH OR PHYSICAL FITNESS. THE ONLY REQUIREMENT IS A COMMITMENT AND CURIOSITY. WE OFFER private functional training, thai massage & traditional massage. private functional training is a 60-minute individualized session combining the postural analysis of the client with range of motion and strengthening exercises to improve the body's capability. THAI MASSAGE IS A FULLY CLOTHED MASSAGE WORKING THROUGH YOGA POSTURES, ACUPRESSURE POINTS WITH GENTLE STRETCHING. THAI MASSAGE RELIEVES MUSCLUAR TENSION, INCREASES CIRCULATION AND RESTORES YOUR BODY'S ENERGY. MASSAGE THERAPY IS A RELEASE OF THE SOFT BODY TISSUE (MUSCLE, CONNECTIVE TISSUE, TENDONS AND LIGAMENTS) TO ENHANCE A PERSON'S HEALTH AND WELL-BEING.